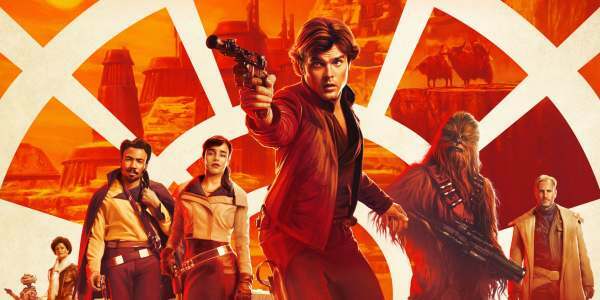 Week 21 Box Office Winner: "Solo: A Star Wars Story"
"Star Wars" movies usually have huge opening weekends. For example, the last "Star Wars" sequel "The Last Jedi" opened with $220 million. The last stand-alone movie "Rogue One" made $221 million in its opening weekend. Even if you take into account today's numbers "Solo's" projected opening weekend of $100 million is abysmal. Most movies these days count on the international box office to pull it over the top. But "Star Wars" latest movie is proving wildly unpopular in other countries. As of Sunday, the movie pulled in a measly $65 million. The biggest return came from the U.K. ($10.3 mil) followed by China (10.1mil). Just looking six months ago to "The Last Jedi" the movie made more than half of it's $1.33 billion hauls from its International cume. This is not good. As part of its marketing strategy, the movie opened to most markets worldwide. Starting with a premiere in the US and France it officially opened in Belgium on May 23, 2018. It's already opened in 43 countries. The only ones left are Croatia on May 31 and Japan on June 29th. Neither is likely to pull in big numbers. So unless Disney uses a Jedi mind-trick on audiences this is as good an opening as their going to get. It's no secret that Disney spends a fortune marketing the Star Wars movies. But this movie is extra expensive since they went through extensive reshoots. All told estimates put the movie costing $300 million. It needs to make that much to break even and more to make a profit. There are a lot of Disney executives sweating these numbers right now. It's probably not the end of the "Star Wars" franchise but the studio is going to think long and hard at the standalone films. In other box office news, 20th Century Fox's "Deadpool 2" moved to the number two spot in its second week. It saw a massive drop in numbers of 65% from its first week to make $43.5 million. Right now it has a domestic box office gross of $208 million and a worldwide total of $487 million. Not too bad but the movie may struggle a bit going forward. Walt Disney's "Avengers: Infinity War" moved to the number 3 spot. It lost about 44% over last week to make $16.5 million for a domestic box office gross of $622 million and a worldwide total of $1.91 billion. It's on pace to make two billion in the next few weeks. Will it finally beat the box office numbers of "Titanic"? Probably not, but it's still impressive. Paramount Pictures's "A Quiet Place" stayed in the number eight spot in its eighth week. It lost 43% to make $2.2 million for a domestic box office gross of $180 million and a worldwide total of $312 million. Warner Bros.'s "Rampage" is still in the top ten as it moved down to the number 10 spot. It lost about 47% for a domestic box office gross of $94 million. and a worldwide total of 413 million. Update: A previous version of this story said that "Solo" made $301 million instead of $103 million. What do you think of the box office results this week?